It's been a while since I've whipped up a "data" map around here. The computer I used to do this with fried long ago. But now, with the help of Inkscape and Linux, my merry map making has resumed, yay! 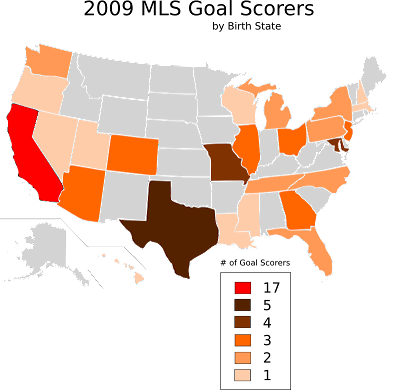 This map shows the birth states of all the American Born players that scored a goal in the 2009 MLS season.